The spacecraft successfully fired a bullet at the surface of an asteroid. Japanese spacecraft Hayabusa2 touched down on the surface of Ryugu Friday — a kilometer-wide asteroid with an orbit that periodically brings it close to Earth as it circles the Sun. And the probe has already completed the first big step of its primary mission: collect tiny rock samples to send home. There was a delay of several hours while the Earth-bound team waited for the spacecraft to resume communications after firing the bullet — the connection broke off when the spacecraft made contact. It’s not the first time the spacecraft has landed on Ryugu. It released two “hopping” rovers in September of last year for its first visit and a third rover on a second mission in October. 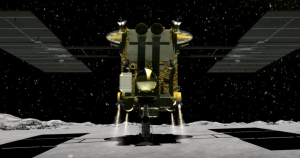 Hayabusa2 will swoop in two more times to collect additional samples later this year. The second approach will hopefully roll out the same way today’s mission did. On its third sample collection mission, the spacecraft will fire a copper projectile into Ryugu to collect samples from the subsurface. The collected samples will then return to Earth in a special return capsule at the end of next year.